This contemporary look corner ladder shelf is a great addition to give your home decor a classic appeal. 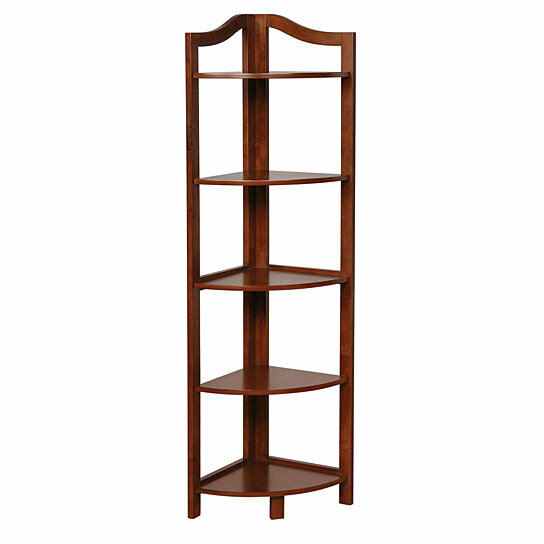 Made up of sturdy wood, this oak brown finish shelf unit features a ladder pattern with open sides design. This corner shelf consists five-tier shelves so that you can give an accomplishment to your favorite decorative such as vases, trophies, etc. and important essentials such as books and photo frames. Keep this furniture piece in any area of your home to create a touch of personal style and creativity with giving it an elegant charm. It features open side design with 5 shelves for placing photo frames, books and other decorative items.